In this morning's news feed I saw someone ask: "what would it be to have a Socrates nowadays questioning famous people?" What would it be, indeed? Would it help people understand justice? Would it help people achieve happiness? Would it help people to become virtuous? Since somehow surviving my death in 399BC I have continued to question people, both famous and otherwise. It is my intention to learn as much from them as I hope they learn from me. Whether my dialogues have actually helped people, I am unsure. But I continue, nonetheless. 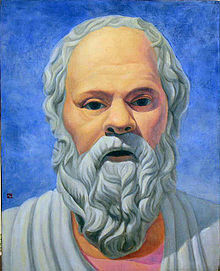 Back to the question: "what would it be to have a Socrates nowadays questioning famous people?" Is the assumption that only I can ask effective questions? This assumption surely is unjustified. Many people I have met are skilled at asking questions and identifying faulty reasoning. Questioning people is not an activity exclusive to me. We can all do it, and I encourage everyone to do it.